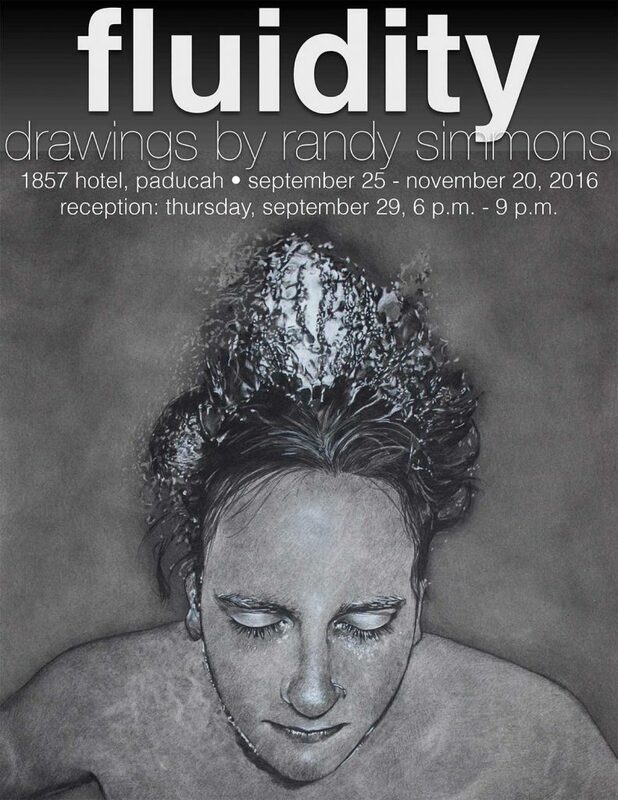 Randy Simmons, Professor of Drawing at the Paducah School of Art and Design (PSAD), will debut Fluidity, a series of large-scale charcoal drawings and images focusing on the human figure and distortions created by water, in an upcoming exhibit. The exhibit will be on view in the lobby of the 1857 Hotel, Paducah’s new boutique hotel located at 210 Kentucky Avenue in Paducah’s historic Downtown, from September 25 through November 20, 2016, with an opening reception on Thursday, September 29, from 6-9 pm. The reception is free and open to the public. Armed with a go-pro camera and iPhone, Simmons photographed family and friends in his swimming pool this past summer, focusing more on distortions and magnifications of the human body as seen from above and looking through the surface reflections. Inspiration for this enthralling work came from Simmons’ friend and writer, David Polk. “David visited my studio in the summer of 2015 and commented about my very first pool/water drawing, 8 Across, 8 Down,” notes Simmons. “David was intrigued by the point of view and of the sensuality of the female form with the water.” The original drawing that spawned the series will be included in the exhibit at the 1857 Hotel along with its counterpart, Gardenia7721. Simmons noted that more of this style of work is to come as he observes the underwater photographs he made in late summer. A Paducah native and nationally recognized artist, Simmons has recently been a merit award winner in the 57th Mid-States Art Exhibition, Evansville Museum of Arts and Science in Evansville, Indiana; a First Place award winner at the Cedarhurst Biennial, Cedarhurst Center for the Arts, Mt. Vernon, Illinois; and one of five equal award winners for the international drawing competition, “Drawing Discourse: 6th Contemporary Drawing Exhibition,” University of North Carolina, in Asheville. In addition to being a Professor of Drawing at PSAD, Simmons teaches for the Kentucky Institute for International Studies with the Italy program. He travels abroad with students each summer, preparing them to be globally competent by exposing them to international culture, art, and history—an effort that enhances Paducah’s reputation as an UNESCO Creative City. For more information, visit Randy Simmons’ website. Simmons can be reached for interviews at randysimmons@me.com or by calling 270.994.6213.